Trousers were introduced to England at the start of the 19th century and they quickly replace the breeches and pantaloons that had been previously popular. They went through a number of stylistic changes during the period, length altered from knee to ankle, tapering changed to tube like, straps worn under the foot were abandoned and braces were introduced. 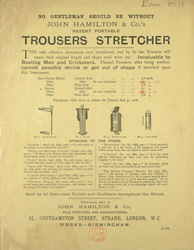 The invention of the trouser press and trouser stretcher, like the one featured in this advert created a fashion for a crease down the front and back of the trousers.